Are You providing a Bluebird Friendly Habitat? 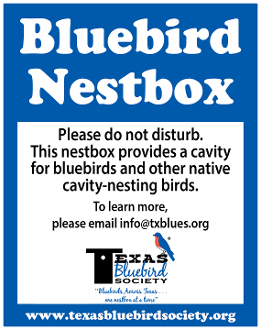 Announce your Conservation Efforts by displaying the Texas Bluebird Society nestbox sign. This 4" x 5" sign is mounted on .040" aluminum and laminated to withstand the elements. Comes standard with holes centered top and bottom.